November 13, 2011, New York: I went back to school this weekend. After ten years away from Morningside Heights, I returned to the New York neighborhood in which I lived as a college student. My husband came along for the trip down memory lane. Morningside Heights, Harlem to its north, and the Upper West Side to its south, were each becoming more desirable neighborhoods in the time that I lived here from 1997-2001. The transitions were happening at the same time university officials were working to infuse life at school with a reinvigorated sense of community. 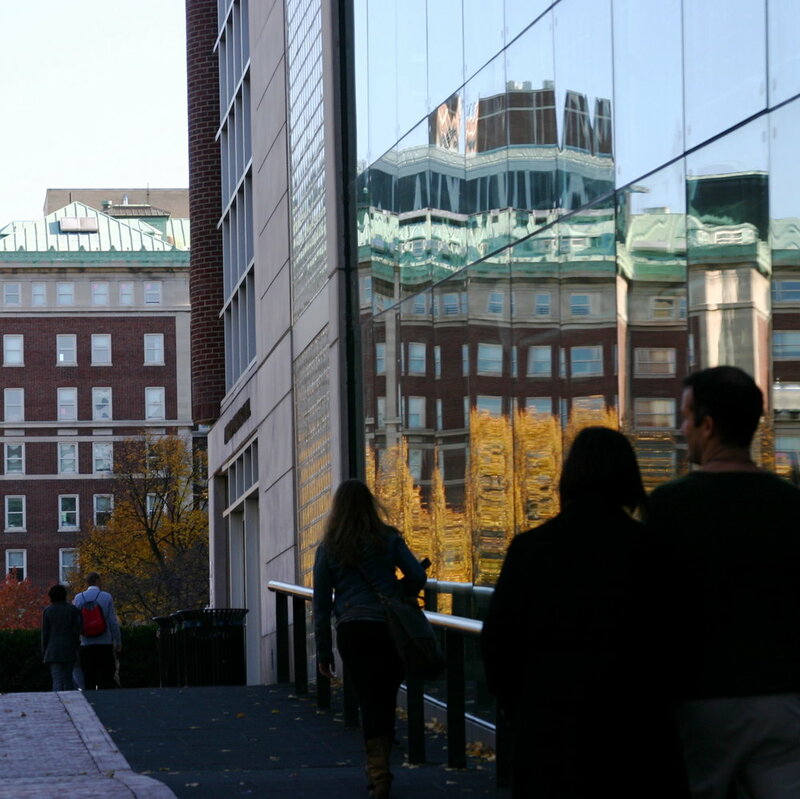 Most notable for an undergraduate, Columbia's student center -- the modern glass facade reflecting its more traditional surroundings in the photo above-- opened its doors in 1999. For the first half of my college experience, there was a hole in the ground there and a construction project in place of a central student hub. Still, we had New York City. Like many generations of Columbia students before us, we had The West End, closed in 2006 after 95 years and since transformed into Havana Central. We had late night pizza at Koronet's and burritos and margaritas at The Heights atop a very steep set of stairs. We had the city and the river beyond, and Riverside, Morningside and Central parks pushed up against us from every which way. This is one of my favorite photos of Columbia and the neighborhood. I took it from a dorm room facing west over the Hudson just a few days shy of graduation in 2001. This weekend, my husband and I picked up sandwiches from my once-favorite deli, a commodity I appreciate fully since leaving New York and living in places where great delis are harder to come by. Hamilton Deli's chicken cutlet called the Lewinsky is still on the menu. From a bench in the center of campus, we ate and talked about our college lives and I pointed out the buildings where I once lived, beginning with the one to the left of the library. On this fall weekend at Columbia, we also watched student tour guides leading groups of high school students and their parents in ever important discussions. They, too, were having conversations about the reasons they chose to live where they do -- about why they selected Morningside Heights. Can You Keep Up With This City?